Sofas come in all sort of styles from formal to casual, from wood framed to upholstered. They also reflect styles of certain periods and countries. 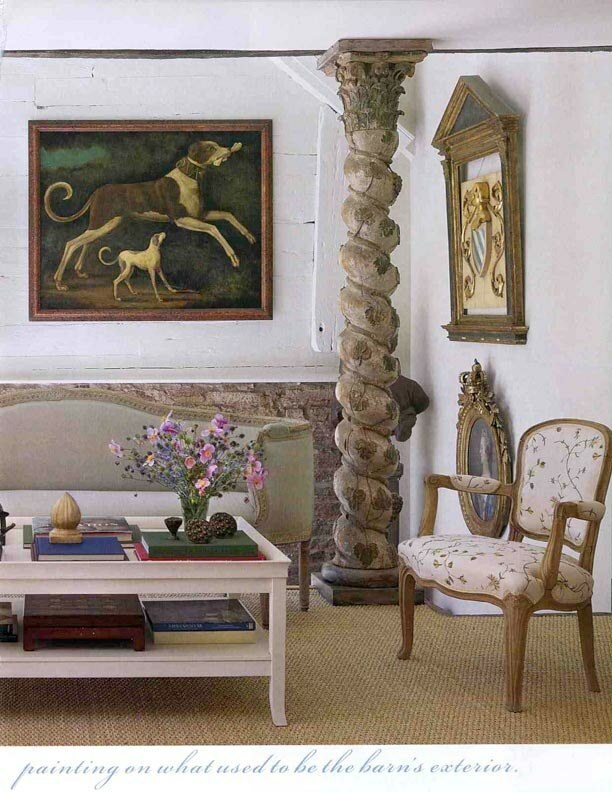 In two Lars Bolander interiors he uses wood framed sofas typical of Swedish and French furniture. They are delicate and feminine in feel. The are probably a bit more formal than many prefer, but create a lovely entertaining ambiance. Very popular just now is mid-century design, and this squared off sofa in Rue Magazine is a great example of the mid-century vibe. It's a cool modern space. 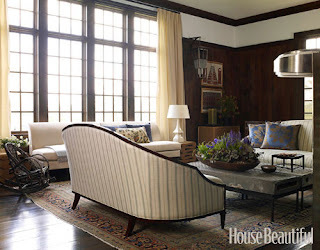 In this Hudson Valley home, the designer Kathryn Scott uses two curved back wood frame sofas to create a comfortable sitting area designed for conversation. I could, of course, find many more examples, but let's see what catches the eye at auction. Wright in Chicago has a Modern Design auction October 6th. There are many fabulous mid-century pieces. This sofa is Lot 218. It was designed by Giovanni Zoncada for Cassina in 1951. It measures 77 inches wide. I particularly love the curve of the arms. I prefer some curves to my sofas, while many mid-century pieces can be pretty squared. This has an auction estimate of $3,000 - $5,000. 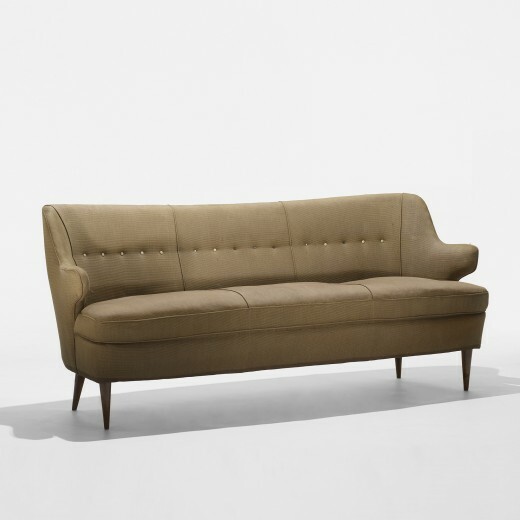 Another sofa in the Wright auction is this Vladimir Kagan designed piece. This is Lot 284, measures 87 inches wide, and was designed in 1950. Again, I like the curved shape. This has an auction estimate of $3,000 - $5,000. This example of a mid-19th century mahogany wood framed sofa is being offered in the next Christie's Interiors sale in New York on October 4th and 5th. This is Lot 913, measures 100 inches wide, and has an auction estimate of $1,000 - $1,500. 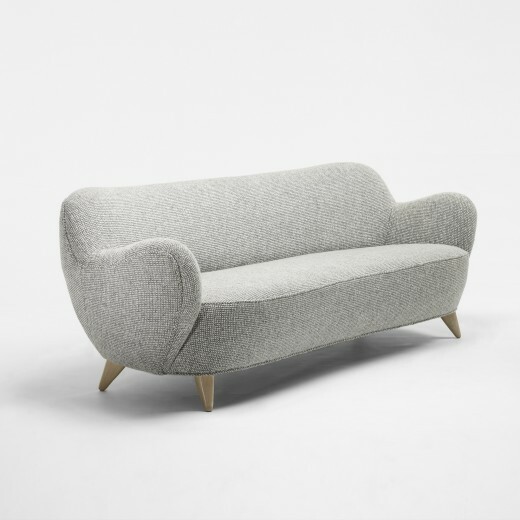 This style sofa can work in a traditional or modern interior because the wood frame is almost sculptural. 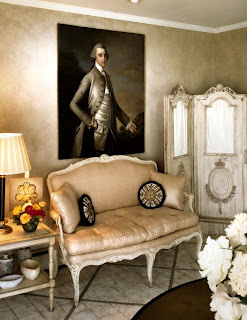 I would polish the frame a bit and reupholster is a bold stripe, or a white linen. 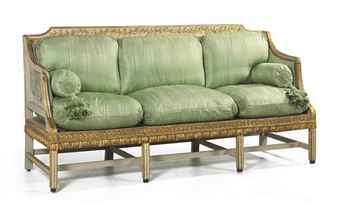 The Christie's sale includes this French fruitwood sofa in the Louis XV style. 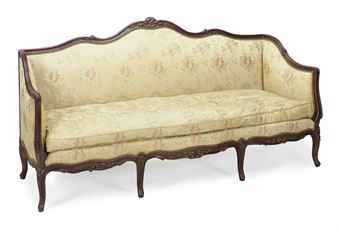 It is 19th century and measures 80 inches wide. This would approximate the look Lars Bolander creates. This is Lot 749 and has an auction estimate of $1,500 - $2,000. I had to include this lovely refined sofa from the Christie's sale. 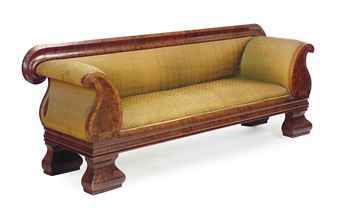 It's a Regency parcel gilt carved frame sofa with caned back, sides and seat. It s described as probably Northern European early 19th century. This is Lot 367 in the sale tilted 500 Years: Decorative Arts in Europe. This is a regular sale of higher end antiques. This has an auction estimate of $10,000 - $15,000 - an investment, and beautiful. Auctions have every style of sofa available - even somewhat used comfy stuffed ones. 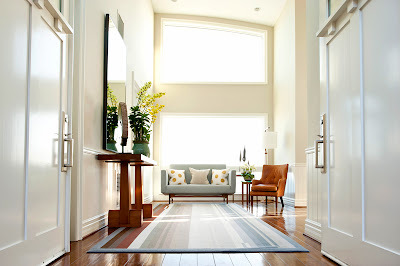 I like the idea of picking something with a bit more of a design statement than an IKEA style to set the tone of the room. It is the biggest piece of furniture in a room after all.